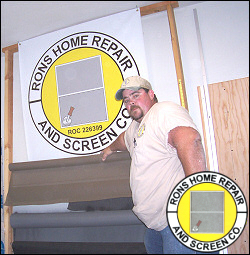 Ron's Home Repair and Screen Co.
Ron's Home Repair is located in the Foothills of Yuma. We have been serving the community for nearly 20 years. Family owned and operated, our goal is to offer a quality job at a reasonable price. 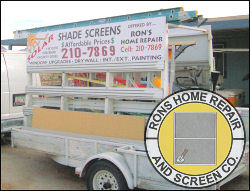 We specialize in fabricating many types and sizes of Solar Screens, offering a multitude of screen materials and colors. If not in stock we will make a special attempt through our suppliers to get what you want. Other jobs that we offer are sheet rock repair and new sheet rock installation and interior and exterior painting. Our work is guaranteed to be done right. We are an Arizona Licensed contractor. 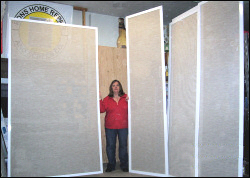 We offer many sizes of screens to suit your every need, including very large screens. We have many colors of screens and metal to choose from as well. No job is too big or too small! In our gallery you can see many examples of our work. Then, please call us for a free estimate. Call us to see what we have to offer you!